An unmatched combination of performance and visibility for your most demanding applications. The T5000 separates itself from the all-flash pack because it’s VM-aware. That means you never manage LUNs and volumes, only what matters to your organization—virtual machines. Take every storage action (clone, replicate, snapshot, manage QoS and analyze) at the VM level and keep storage simple. If you want to see across your entire infrastructure, and see into real-time performance, then take a closer look at the T5000 series. 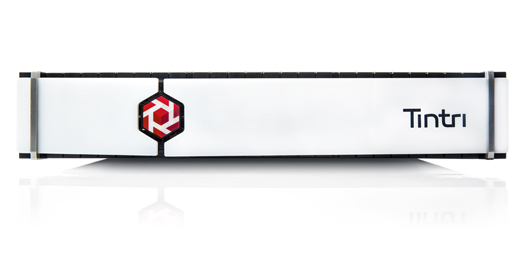 The Tintri VMstore T5000 All-Flash series offers you an unmatched combination of performance and visibility for your most demanding applications. The T5000 delivers all the benefits of Tintri’s VM-aware performance isolation and per-VM QOS while guaranteeing high performance and low latency across the entire flash capacity. The T5000 series enables all storage action at the VM-level—manage, replicate, automate and analyze any (or every) VM to keep storage simple. Tintri’s all-flash and hybrid-flash arrays share a common OS and analytics so you can balance workloads and manage your entire footprint from a single pane of glass. You’ve embraced virtualization, and now you need storage to help you fully realize your data center vision. Tintri is the storage standard for virtualized enterprises and cloud—built from the ground-up to let you manage what matters to your business: applications. Conventional storage was built on decades-old architecture, when workloads were physical and LUNs ruled. Today, those relics cost IT professionals both time and money. Choose Tintri and benefit from the performance, manageability and value of VM-Aware Storage in either all-flash or hybrid-flash systems. Unlike traditional arrays, which do not differentiate VMs and simply funnel them through the FIFO “I/O blender”, each VM on Tintri gets its own “lane”. It helps to contain the noisy neighbor problem while ensuring a fair chance among VMs. Applications performance becomes more predictable even with mixed workloads. No more over-provisioning as a tradeoff for performance. Tintri is the first and only vendor that guarantees VM-level Quality of Service (QoS). Enabling user-defined performance guarantees (min IOPS) and throttling (max IOPS) is as simple as drag and drop. With visualization of performance resources and contention, you get immediate feedback on the impact of your change on latency and overall system throughput. Tintri prevents rogue VMs from suffocating your performance. Tintri is the first and only storage that can point out latency from network, host or storage with the power of intuitive, per-VM and per-disk visualization. Real-time, actionable and historical data allows for immediate troubleshooting and insightful trending analytics. Simple, automated management across the infrastructure is finally possible because everything is at VM-level. 98% reduction in mundane tasks helps IT refocus on strategic operations. Per-VM snapshots and clones – with no performance impact – can be scheduled automatically by default. Since all data services are per-VM there is no spillover to other VMs. Clones are nearly instantly available to hypervisors. Administrators can create on-demand fully functional clone VMs to remote VMstore systems much more efficiently. Instant provisioning and space-efficient clones can support VDI, private cloud and test/dev environments. With ReplicateVM, per-VM replication can reduce up to 95% in WAN utilization after deduplication and compression. Tintri supports multiple concurrent hypervisors, including VMware vSphere, Microsoft Hyper-V, OpenStack and Red Hat Enterprise Virtualization (RHEV). a All capacity values are based on Base 10 (i.e., 1 TB = 1,000,000,000,000 bytes) after double parity RAID-6, spare, and metadata overhead. Effective capacity is calculated after data reduction using inline deduplication and compression but does not include thin provisioning, which typically provides an additional 2.3x capacity benefit. Data reduction typically provides 3-5x capacity savings.